Your kids will love your forever in one of these awesome Kids Vapodri+ Evo Pro S/S Training Jerseys. Made to look great and boost performance with Canterbury’s patented moisture wicking technology, they’ll be the envy of their mates at Origin time or any time at all. NOTE: No alcohol or gambling sponsor logos. 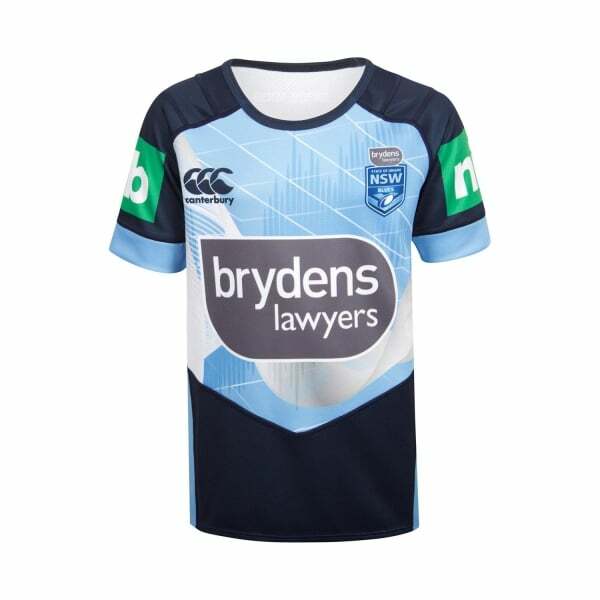 If your kids love the game as much as you do, they’ll love you forever in one of these classic Blues replica jerseys. The Kids Vapodri+ Evo Pro S/S Training Jersey will make them the envy of their mates, whether they’re training on-field or just hanging after school. In sizes for 6 to 14 years, this quality jersey also features Canterbury’s cutting-edge Vapodri+ moisture wicking fabric technology, so it’ll boost their performance by keeping them cooler and drier for longer. A classic crew neck with contoured side and lower front panels and featuring sublimated team and sponsor logos (no alcohol or gambling), this is a must have addition for every Blues supporting family.